let me own a foriegn car. damn bob u dug DEEP to find this post..
Now...can someone help me down off this soapbox?? Just JUMP Angel, we'll catch ya! I think what bothers me most are other Studebaker owners/purists who look down on me and our car because it is modified and not pure Studebaker. Very few cars I have ever owned in my life are modification free, regardless of marque. That's just the way I am. Of course, that's just my opinion, I could be wrong! I appreciate ALL kinds of cars, glass, steel, stock, rods etc. The snob thing is more widespread than you think. Some people are focused on one type of car philosophy and look down on all others. Clubs are a good place to find this. You take a car to an event and all the old timers will tell you what's wrong with your car compared to the national rulebook/bible. Big turnoff to start out. And folks wonder why their membership is down. All folks don't have a lot of time to massage on cars for hours on end. To those that do almost all the work themselves good for them. To those that have worked their whole damned lives and finally have a few bucks to buy a turnkey rod good for them too. The hobby can be all things to all people as they participate at the level they're comfortable with. Just as long as some jamokes aren't badmouthing either peoples' personal labor results or the guys that just wants to cruise and not turn wrenches. When I am at a cruise in I look around at the cars and talk to owners and could care less who did exactly what work themselves and who didn't or how much anyone spent. And since all cars don't turn out like George Barris creations the levels of quality or even unfinished cars are interesting too. Wow, just joined and now I feel out of place! Don't know where I will fit in. I have a 03 f-150, eclipse gsx (YEA RICE)! and am working on a 55 fairlane. Oh and I wear 2 gold chains for what it's worth. But I do have a problem with the guys that have more money than brains. I feel that if you have to call AAA to change your flat you might not be a rodder!! I have found that there are many great rodders out there. I have also seen a few snobs. 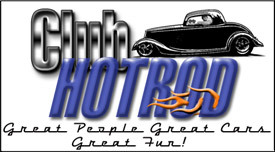 I think that some of the biggest snobs are the “rat rod” or "retro rod"snobs. They claim that people with painted cars, glass cars, and or high dollar cars thumb their noses at the “unfinished rods”. They condemn these people for their perceived snobbery and at the same time they think that their car is better because it is original steel or they built it themselves. It is like the kettle calling the pot black. I am a car fan through and through. I do not look down upon any ride unless it is unsafe. I may not like every car I run across, but I can appreciate the time and dedication it took to bring it to drivable condition. As for what is a rodder. I think that a rodder is anyone who owns a rod (I will let you guys define what you think a rod is), is passionate about it and knowledgeable about it. The type of car or state of finish does not determine if you are a rodder. I think your passion and knowledge makes you a rodder. Now you do not have to know everything about building a car but at least know what you have. I have met quite a few people who have more money than talent or time and have had a pro build them their dream car, but each one of them knew what they wanted and knew how to achieve it. Yes, they are rodders. It is ignorant of people to look down upon any rod or person who owns a rod based upon the material the rod is made of, paint or lack there of or who built it. I personally prefer original steel cars over glass, not because I think it makes them better, but for the historical value of it. I do not believe that it is any easier or harder to build a glass car. It all depends on how good the foundation is. I would think that a glass body that needs a lot of work to make it fit will take longer than a clean steel body to build. Can’t we all just get along??? Sorry for that, I just could not pass it up. Last edited by itsaposcj5; 07-24-2005 at 02:22 AM. "PLAN" your life like you will live to 120. "LIVE" your life like you could die tomorrow. ....and we wouldn't currently have a terrorist war going on....huh? I guess it is the nature of the beast. From personal experience, I know that just a good comment or 2 from people is worth more than any trophy I might have sitting on the shelf. It also goes a long way in overcoming the negative things that some clown may have said. This quote from Mike's comments back when when Uncle Bob originally made this excellent posting says it for me, too. I have had only two cars that I put in shows. I always stood back and observed the people who paid to look. Yeah, I got frosted when some guy announced loudly that the weld beads on the frame of our roadster were big and ugly and should have been ground down. GEE, SIR! THANKS FOR YOUR KIND OBSERVATION! (We got the trophy anyway). But it really pleased me when somebody stopped and said a little something like "Man! I really like your treatment of the rear view mirrors on your sedan", or "Would you mind if I stepped in there and took a closer look at (some aspect of the car)? or "Would you mind if I took a picture of my kid in your car?" Those people made the trouble and expense worth while. Great thread what hit me a snob is a person that sits behind there car at a show and shine and you ask a question about there car and they act like they didn't here you. I have found if you say nice car and tell them your building a car they will get up and answer all your questions. What I'm trying to say is next time your at a show or show and shine take the time to answer questions that's why we go there to talk cars and make friends don't be a snob. Mark, My wife and I sit behind our cars at shows and we respond to anyone. So if you are in the neighborhood, come on by, we have a spare chair and will answer all your questions. Even the ones about why the car has dings and when will it get a new paint job and why are the wheels dirty. At my age I can't afford to be snobbish. BTW, Nice thread, Bob. Glad I wasn't here 5 years ago when you first wrote it, cause reading it would probably have given me a migraine. Now I'm less stessed, headache free, and suffer from reading fatique. A good friend will come and bail you out of jail....but a true friend will be sitting next to you saying..."Damn....that was fun! Right on mopar that's what I'm talking about if I ever make it out east your on. You nailed that one on the head. I have been a car nut for as far back as I can remember going to the drag strip and seeing brand new black 57 Chevy’s running with wide whites hub caps off, and red rims. At a James Dean car show I asked a guy what about the paint on his 55 Chevy, as the color was really nice. He said he didn’t know me being in my 50’s at that time I just let it go. Oh but my wife didn’t let it go, she said this is your car and you don’t know what color it is! Then the guy said it was paint from a Harley Davidson, called almond. The guy had pictures of the car being built but didn’t want to talk about it. That was one incident and over the years, if they don’t want to talk walk away, and enjoy the show.